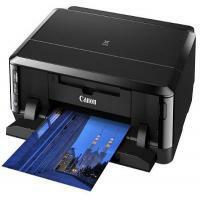 Canon Pixma iP7250 is a single function high quality colour printer. The printer is capable of delivering a maximum resolution of 9,600 X 2,400 dpi. The device offers you wireless connectivity and lets you directly print your files from Android, iOS, AirPrint app. Along with A4 printing, the device is also capable of printing directly on CDs/DVDs. It also offers USB connectivity, borderless printing and automatic duplex printing. The Canon Pixma iP7250 is a sleek designed attractive printer with a small footprint. It weighs approx. 6.6kg and measures 451 x 368 x 128 mm. It has input trays in front which can hold up to 125 sheets of plain paper and 20 photo blanks. Just above the photo tray, it has a small tray to hold CD/DVDs. On the left front side of the printer, there is a small control panel with no display. The printer uses high-quality Canon Pixma iP7250 inks with its five individual ink system that reduces the running cost of the printer. The Canon Pixma iP7250 is a great printer that offers high-quality printing with many advanced features like, automatic duplex printing, wireless and USB connectivity, CD/DVD printing etc. The low-cost printer would be perfect for the people who are looking for high-quality printing device. However, being a single-function device and having no LCD display or memory card slots, the printer might not be a pick for home office users. How to install Canon Pixma iP7250 ink cartridges? 1. Make sure your printer is on and connected to the PC. 2. Open the top cover of the printer where the ink tanks will be installed. You will find this cartridge access door at the top front of the device. Once you open the cover wait for everything to settle down. Do not touch inside until the movement stops. 3. Now remove the protective wrap from the ink cartridge. You will find an orange tape on the top of the cartridge, remove it completely. 4. Hook your fingers under the orange cap and slowly pull it out. Make sure you do not press the sides when the Y-shaped groove is blocked and also make sure your do not touch this Y-shaped groove. 5. Insert the Canon Pixma iP7250 ink cartridge and push it down into the matching colour slot. Make sure there is a click sound when you push the cartridge in. Check that the ink lamp is lit on the printer, then install the next ink colour cartridge in the same way. Check that all lamps are lit, after you finish inserting the cartridges. 6. Check that the Inner Cover is closed, then close the Top Cover. Don't close the Paper Output Tray yet. 8. After about 3 to 4 minutes, check that the POWER lamp changes from flashing to lit white. If the Alarm lamp flashes orange, check that the ink tanks are installed correctly. 9. Close the Paper Output Tray. The Output Tray Extension closes automatically. Q. How can I clear the message “paper jam inside” for my Canon Pixma IP7250 printer? Unplug your printer from the socket. Q. If I purchase Canon Pixma IP7250 ink cartridges from you and need help with the installation process or other issues related to the ink cartridges even at a later date and not immediately, would you provide the required support? Thanks. A. Yes, you can contact us anytime with any concern related to Canon Pixma IP7250 ink cartridges or any other purchase. We’ll be glad to help you out; you just need to be ready and provide the relevant details to help us serve you better. For help, you can contact us at 048 30833221. Q. Before buying Canon Pixma IP7250 printer for my personal use, I would like to know which connectivity options are supported by this printer and which not? A. The printer supports wireless and USB connectivity but lacks memory card slots. Q. Are the compatible Canon Pixma IP7250 ink cartridges you sell guaranteed? A. Yes, definitely. The compatible ink cartridges of our sites are 100% guaranteed and quality certified. Make sure that you store the ink cartridges in proper environmental conditions. If any product of our site is deemed to be faulty, we will refund or return the item within 12 months from the following date of purchase. A. You will need to use the CD-ROM that you received with your printer to install the drivers on your computer. If you do not have the CD-ROM, you can also download the drivers from the Canon support website. Q. Can using compatible Canon Pixma iP7250 ink cartridges cause any damage to my printer? A. Absolutely not! Our compatible Canon Pixma iP7250 ink cartridges are of high quality that have been FSC tested and certified and are designed to work well with your printer. You can use our compatible ink cartridges without any worry about damage caused to your printer. Q. Where can the Canon Pixma iP7250 printer ideally be used? A. Canon Pixma iP7250 printers come with built in Wi-Fi support and have a moderately low running cost, making it suitable for home users. This printer can also print up to a high resolution of 9,600 x 2,400 dpi and can generate lab quality photos making it a perfect choice for photographers. Q. How many pages can your compatible Canon Pixma iP7250 ink cartridges print? A. Our compatible Canon Pixma iP7250 ink cartridges are XL ink cartridges that have a higher page yield as compared to original Canon Pixma iP7250 ink cartridges. The compatible PGI550 black ink cartridge can print up to 1130 pages and the CL551 black ink cartridge can print up to 500 pages. The CL551 cyan ink cartridges are capable of printing 267 pages, yellow ink cartridges are capable of printing 274 pages and magenta ink cartridges are capable of printing 313 pages without having to be replaced. Q. I had recently ordered a multipack of Canon Pixma iP7250 ink cartridges. All of the ink cartridges were intact except the yellow ink cartridge which was damaged. What should I do for a replacement? A. We truly apologise for the inconvenience caused. Please contact us on 048 308332211 or email us on info@printerinkcartridges.ie regarding the issue within 30 days of receiving your product. Just have your invoice number and order details ready and we will guide you through the process. Q. Can I rely on compatible Canon Pixma iP7250 ink cartridges for quality performance and optimal output for professional purposes? A. Absolutely. The compatible ink cartridges are on par with their original counterpart in every way as they provide fine quality printouts that suit top level professional commitments too. In fact, the page yield is higher when compatible ink cartridges are chosen over original cartridges. Q. I need to save up on time I need for printing and cut down on printing costs. Will the compatible Canon Pixma iP7250 ink cartridges help me? A. Yes, compatible Canon Pixma iP7250 ink cartridges are proficient at printing fast and reducing total printing costs too. Q. Can I install compatible Canon Pixma iP7250 ink cartridges in my printer (I use iP Canon Pixma IP7250) to print vivid images and clear text on different types of speciality media? A. Yes, these Canon ink cartridges are adept at printing colour images and documents on a plain page as well as speciality media. Q. Can I install compatible Canon PGI-550XL and CLI-551XL cartridges in printers other than Canon Pixma IP7250 printer? A. Yes, these ink cartridges from the house of Canon work efficiently with a number of printers besides Canon Pixma IP7250. Q. Will my Canon Pixma IP7250 printer work if any one ink cartridge from my Canon Pixma iP7250 ink cartridges set isn’t installed? A. No, you need to ensure that all the ink cartridges of the pack are installed to get your printer working. Q. Can I use the compatible Canon Pixma iP7250 ink cartridges (PGI-550XL and CLI-551XL ink cartridges) in my printer to print on DVDs and CDs? A. If the disks are printable and your printer model supports CD / DVD printing, you can print on DVDs and CDs with Canon Pixma iP7250 ink cartridges installed in your printer. Please check your manual for details. Q. Are canon printers better for printing professional standard photographs because they are the same brand as cameras? A.There are many printers in the Canon brand that are manufactured for various uses. This does not mean all Canon printers are for professional photo printing use, however, there are some printers in the PIXMA range that are for home photo printing. For professional use, the PRO series is perfect. A. Hi Marty, if you have ordered before 12PM, you should recieve them tomorrow (Tuesday) by Fastway Couriers. Q. I have an iPad and am wondering if it is possible for me to print to this printer? A.Yes, you can indeed print to the Canon Pixma IP7250, as it is compatible with Apple Air Print, allowing wireless printing from any room to your printer. It is also compatible with iPhone as well as Android Smartphones and Tablets. Q. Is it possible to order via telephone I have trouble entering card details online? A. Yes, you can. Simply call us on 028 3083 3221 from NI and 048 3083 3221 from ROI. Q. Why do some people advise against using compatible cartridges.? A. Some believe that because compatible cartridges are not manufactured by the printer brand itself that there is a decrease in quality. When in fact the quality is just as good, however you are not paying for the brand name of your printer. There may be a small difference when printing photographs etc, but when printing general everyday documents, there is no difference whatsoever. Q. I bought a multipack of 12 cartridges since I used to use the printer quite frequently. I have not been using my printer lately. What is the tentative shelf life of Canon Pixma iP7250 ink cartridges? A. Our Canon Pixma iP7250 ink cartridges have a shelf life of 2 years. It should be stored at room temperature and handled with caution. This is a major cause of concern for the customers who buy multipacks but our inks do no dry up. Just make sure of stocking it up with attention and appropriate room temperature. Q. The black ink has been exhausted from my Canon Pixma iP7250 printer. Can I replace only the black cartridge? A. Yes, You can replace only the exhausted colour. Black comes in two packs i.e black and photo black. You can buy either of them according to your usage from our website. Q. What are the colours available in Canon Pixma iP7250 cartridges? A. Canon Pixma iP7250 uses 6 colour ink cartridges. The colours can be black, photo black, yellow, cyan, magenta and grey. You can use any 6 of them according to your need. Q. I was really curious to know why the compatible Canon Pixma iP7250 ink cartridges cost less than the original ones? Does the cost cutting affect the quality of the ink? A. A genuine cartridge is one which has not been remanufactured or refilled. It is manufactured for the very first time. The fact that it has to be made from the scratch makes the cartridge more expensive than the compatible version. The compatible version on the other hand, is the refilled or the remanufactured ink cartridge. It is cheaper, but the efficiency and quality of the compatible one is at par with the genuine cartridge. The low cost has nothing to do with efficiency, it is only because refilled cartridge doesn’t need to be manufactured from the scratch. Q. Are Canon Pixma iP7250 ink cartridges suitable for printing photos on gloss paper for albums? A. The Canon Pixma iP7250 is a photo printer dedicated to provide professional quality prints at home. It’s compatible Canon Pixma iP7250 ink cartridges have bright and lively looking ink colours to complement the efficient printing of printer. The ink stays on all kinds of papers the printer supports. Q. I am a principal of a school in Ireland. I wanted to place bulk order for cartridges of printers at my school. Can I visit your office for the same? Q. What are the OS versions of Windows that the Canon Pixma IP7250 is compatible with? A. Canon Pixma IP7250 is compatible with Windows 10/10 x64/8.1/8.1 x64/8/8 x64/7/7 x64/Vista/Vista64/XP which are all the versions of windows being used widely. Q. Can i order Canon Pixma iP7250 ink cartridges if I am a resident of Northern Ireland?